Father Francis was born in Auburn California. At 17, he joined the USMC as a combat engineer and chaplains' assistant, graduated with a BA degree in liberal arts from CSUS, and was commissioned as an army officer. Father served as an Army chaplain in both Bosnia and Germany. Father served as a prison chaplain at California Men's Colony and CSP Solano. 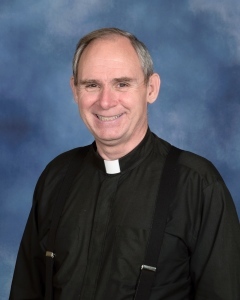 Lastly, Father Francis has served as a parochial vicar in several parishes in our diocese: Holy Spirit in Fairfield, St. Charles in Sacramento and, at Good Shepherd in Elk Grove California. Fr Francis enjoys walking, making videos for YouTube and cooking meals for friends and family.